Donkey Kong for the Wii? Donkey Kong, along with other Nintendo franchises (Kirby, and maybe Yoshi), hasn’t seen a “true” release in a long time. In recent years Donkey Kong’s home console games have been limited to drumming games. Portable games have been limited to simple games where the only thing that Donkey Kong can do is swing from 2d vine to another 2d vine or limited to merely being a victim of the Mini-Marios. During the SNES era, Rare, the company now owned by Microsoft, made 3 Donkey Kong games, Donkey Kong County, Donkey Kong Country 2 – Diddy’s Kong Quest, and Donkey Kong Country – Dixie Kong’s Double Trouble. These three games were some of the best games made for the Super Nintendo. During the N64 era, Rare’s Donkey Kong 64, was the first game to use the N64’s expansion. The game was the first game to show off what the expansion pack could do and it was the first game to truly bring Donkey Kong into the third dimension. Kirby’s last big game for a console, Kirby’s Air Raid, was also a big diversion from the main franchise. Now Nintendo, you have to remember that if you bring a franchise away from the main series, you have to bring it back. Donkey Kong and Kirby haven’t seen a “true to the franchise” game for a home console since the Nintendo 64 era, although the Kirby experience has continued on Nintendo’s portable consoles. Does Nintendo not release these games, because of the painful memory of their lost company, Rare, who made these games? I don’t think that’s the case, because Microsoft (the owner or Rare) has supported Nintendo’s portable console. If for some reason Nintendo doesn’t want to pursue a 3D Donkey Kong game for the Wii, I would still love to see a 3d Donkey Kong game, so I would love to see Rare do what they did for Diddy Kong Racing DS and release Donkey Kong 64 on the Nintendo DS. So, I think it’s time to bring back a 3d Donkey Kong for Nintendo’s latest console, the Wii. Why, because there is no reason Nintendo shouldn’t make another 3d Game for the lovable Nintendo character. I’d say the game should be cell shaded, when I think of Donkey Kong, I think of him as a cartoon, even more so that Mario or Zelda. 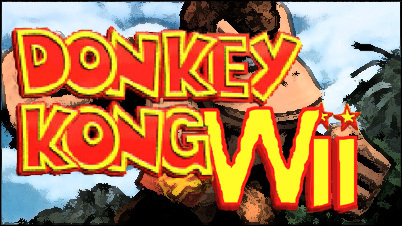 But, either way, Donkey Kong on the Wii would be an enjoyable graphical experience, because outside of Brawl we’ve never seen a highly defined Donkey Kong franchise character or DK environment. When Super Mario galaxy came out, and people saw Bowser’s hair waving in the air, they had one of those “WOW!” moments. I think having Donkey Kong on the Wii would offer something similar, because no one has seen a Donkey Kong that was using the Wii’s graphical abilities. I for one would love to see DK in a lush environment, with hair that looks like hair and not a series of monkey shaped polygons, with buildings that don’t pop up when come close to then and disappear when walking away from them and Icons where you can see the edges of the pixels. What would be the story? Well they would just what they do with all Nintendo Franchises, by repeating themselves, like Mario saving the princess, Link saving Zelda, and Donkey Kong finding the Golden Banana’s for some reason. Outside of bring the game back to its roots, I think DK fans would enjoy a Vine swinging game, similar to what NiGHTS 2 had to offer in its flying dynamic, but in a more flat environment, and with more vertical path’s. If that would stand as a game itself, I would love to see it added as a feature to a 3d Donkey Kong game for the Wii. Either way, if Nintendo keeps releasing these gimmicky games feature these icons with out releasing titles true to their respective franchises these franchises will loose their identity. This entry was posted on Monday, June 23rd, 2008 at 10:39 pm and is filed under Nintendo. You can follow any responses to this entry through the RSS 2.0 feed. You can leave a response, or trackback from your own site. One more thing. I believe that there are several travel insurance web sites of respected companies than enable you to enter a trip details to get you the quotations. You can also purchase an international travel cover policy on the net by using your credit card. All you have to do should be to enter your own travel details and you can begin to see the plans side-by-side. Simply find the program that suits your allowance and needs after which it use your bank credit card to buy it. Travel insurance on the web is a good way to take a look for a reputable company to get international travel insurance. Thanks for discussing your ideas. Hey, you used to write excellent, but the last few posts have been kinda boringˇK I miss your great writings. Past few posts are just a little bit out of track! come on! One other thing is that an online business administration diploma is designed for college students to be able to well proceed to bachelors degree courses. The 90 credit education meets the other bachelor college degree requirements so when you earn your own associate of arts in BA online, you will get access to the modern technologies in this particular field. Several reasons why students are able to get their associate degree in business is because they may be interested in the field and want to find the general education and learning necessary prior to jumping in to a bachelor education program. Thanks for the tips you provide in the blog. I have observed that in the world these days, video games will be the latest craze with kids of all ages. There are times when it may be extremely hard to drag the kids away from the activities. If you want the best of both worlds, there are several educational activities for kids. Great post. Hello, Neat post. There’s an issue along with your website in web explorer, may check this?IE nonetheless is the marketplace chief and a good section of folks will pass over your wonderful writing because of this problem. Hey, very cool web site!! Man .. Excellent .. Amazing .. I’ll bookmark your website and take the feeds also…I am happy to find numerous useful information here in the post, we need develop more techniques in this regard, thanks for sharing. . . . . .
Hi there, just discover the blog site as a result of Yahoo, determined that it must be absolutely educational. I’m going to look out for belgium’s capital. I will be relieved in the event you carry on this in the future. Quite a few people may very well be had good results through your creating. All the best!